Trust&Travel offers holiday rentals on Italy's finest historical estates. Our mission is to offer our clients genuinely authentic holidays on some of Italy's finest historical estates. Rent your villa, castle, agriturismo or holiday apartment in the most picturesque areas of Tuscany, Sardinia, Sicily, Umbria and around Venice. In Italy, where public transport is not always quite up to the mark, bike-sharing doesn’t just make for an ecological, but also for a very practical choice. Whether you set your heart on Mobike or on any other bike sharing provider, you’ll be able, at your convenience, to pedal through many of the large cities of Northern Italy. Have a look at this world bike-sharing map and its updated Italy section. In other great cycling locations, like Lucca or the Maremma Natural Park, bike-sharing may not have been implemented yet, but you can easily rent bikes from local suppliers… Enjoy the ride! Years ago, during a dinner in Montalcino, I overheard winemaker Donatella Cinelli Colombini tell the story of her winery. When she started producing her own Brunello wine in 1998, she wanted to hire a young cellar master. So she got in touch with the University of Siena to ask whether there were any graduates looking for a job. And the answer was: No, unfortunately they have all been snapped up by other estates. Well, this was not entirely true: there happened to be, at that time, several female graduates who were in quest of jobs, but nobody would bother to mention them, as Tuscan wineries were only interested in hiring male staff. As soon as she got wind of this, Donatella decided that it was high time things changed. She affixed the words Prime Donne (First Women) to the name of her estate, Casato, and would manage to prove to the world, soon afterwards, that excellent first-class wines could also be produced by women. Within walking distance of Florence’s main sights, like the Duomo and the Uffizi Gallery, there is the underground Santa Maria Novella parking lot (parcheggio in Italian), located right below the train station of the same name. And for those of you who are planning to explore the city’s artisan quarter – which I told you about in a previous article –, there is the Oltrarno Calza parcheggio, less central than the former but cheaper, nearer to sights such as the Palazzo Pitti, and within easy reach if you’re coming from the Chianti. You can access it from the Porta Romana. Another good news: the City of Lilies has just added to its transport infrastructure a new tramline which will prove to be a godsend to visitors unwilling to get trapped either in rush hour or in the “restricted traffic areas” – about which Google Maps is not always fully reliable. The new T1 tramline links the city center to the Villa Costanza parking lot, which is located right next to the Rome-Bologna highway – with its own dedicated highway exit. The journey to downtown Florence takes just over 20 minutes, and trams leave every 6 to 8 minutes. Inaugurated in 1990, the Galleria Continua boasts two exhibition spaces in San Gimignano: one in a forsaken and characterful movie theatre, the other looking onto the beautiful Piazza della Cisterna. The Galleria has also successfully branched out to Beijing, Habana and Boissy-le-Châtel, near Paris. 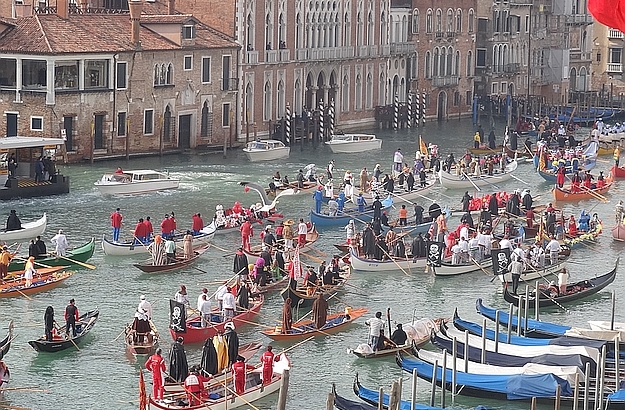 The Serenissima’s water parade is a kaleidoscope of sounds and colours! The 2019 edition of the Venice Carnival will be launched on February 16, and extend over 18 colourful and boisterous days until Shrove Tuesday, on March 5. The beautiful water parade on the Grand Canal will be starting at 11 AM on Sunday, February 17. In other words, should you happen to be staying in our Borsato apartment, you’ll be able to party the night before, have a long lie in, and then watch the dazzling spectacle in your pyjamas while sipping a cappuccino or, why not, a glass of champagne! In Livorno, the cecina comes in the shape of a sandwich: a chickpea cake filled with marinated aubergines and nestled between two slices of crusty bread. It’s yummy, low-priced, and Italians call it a cinque cinque, a “five-five”. You’ll find the best wood-oven cooked cinque cinque at Da Gagarin, a small eaterie opposite Livorno’s market. . Washed down with the traditional glass of spuma, a carbonated drink, your simple and scrumptious feast won’t set you back more than a few euros!